If you have a steel garage door that's been on your home for a while then you most likely have a bottom seal on the garage door that is cracked, hardened or torn. Years of being in the elements can damage the seal along with chipmunks & squirrels that want to get in your garage for that birdseed you have sitting in there. You'll be able to seal up the garage, keep out the elements and hopefully the critters by replacing the worn out seal with some new seal. Replacing the bottom garage door seal is not difficult but it can be frustrating so we'll go through some steps below that will hopefully take away some of that frustration. Determine What Seal You Need - there are different styles of seals. There are some common ones that many manufacturers use and then a few odd ones. You'll need to determine what seal you need and it's best if you can cut a piece off of the existing bottom seal. Raise you door part way so you can reach the bottom seal and if you can cut a 2" to 3" piece of the seal off (scissors usually work well). Also take a few pictures of the seal and retainer (that's the aluminum piece the seal slides into) - we'll discuss the pics a little later. Measure The Bottom Seal - take the piece of seal you cut and take a measuring tape or ruler to get some measurements. Measure the width of the seal as it lays flat. Next you'll want to determine what "style" of seal it is. The most common "style" is the T-style seal but there are also P-Bulb style, Bead style, T-Bulb style and others. On the T-style seal these are the parts of the seals that look like a "T" and slide into the bottom seal retainer. You'll want to measure these T's on the seal as this will determine which seal will fit into the bottom seal retainer. You're basically measuring the side of the seal. Write down your measurements. The most common widths are 3" and 4" (but could be anywhere from 2-1/2" to 4-1/2"). The most common "T" measurements are 1/4" and 5/16". Measure the Width of the Garage Door - don't measure the garage opening as your garage door may be slightly larger so take an accurate measurement of the width. Single car doors will be around 8' to 10' wide while 2-car doors will be 16' to 18' wide. Garage doors can be made any size though in 1" increments so that's why it's important to measure the door and not the opening. Order or Pick Up Your New Seal - now that you have the measurements you can get the new seal. You can go to a local hardware but they may not carry the seal you need as most may only carry the 5/16" T-style seal but not the 1/4" T-style seal. 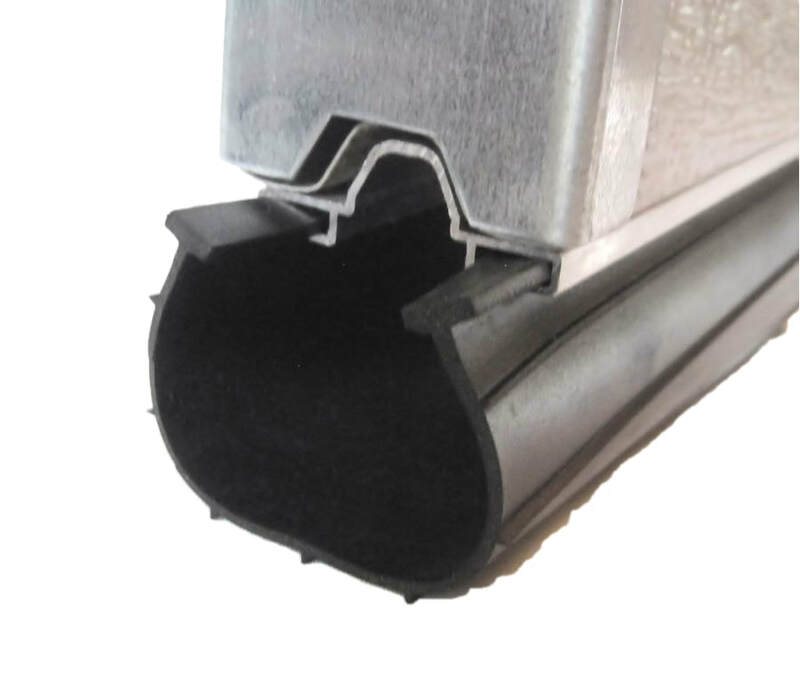 At the GarageDoorZone.com we carry the 1/4" T-style seal in 3" and 4" widths in vinyl and rubber and the 5/16" T-style seal in 4" rubber. Whether you get it locally or online be sure to get it 5" to 6" longer than the length you need (we'll cover why later). At the GarageDoorZone.com store we ship all of our seals 6" longer than what you order at no extra cost. You can shop for bottom door seals here. Check Your New Seal - before you remove the old seal from your door check & make sure the new seal will work. Take measurements of it & compare it to your old seal. Also take the new seal & see if you can slide the seal into the retainer a little bit & that the "T" part of the seal fits in the retainer easily without being too hard to put in or too loose and falling out. Unplug the Opener & Lift the Door - now that you have the proper seal for your garage door you can install it. First you should take a few safety precautions: A) Unplug the garage door opener (you don't want someone to accidentally pushing a remote while you're working on the door). B) Pull the red emergency cord on the opener to disengage it from the door and lift the door manually. At this point if you can't lift the door or it's too heavy to lift you should stop & call a professional as there may be something wrong with the door springs. A balanced garage door should be easy to lift manually. Raise the Door - raise the door up until the bottom of the garage door is just below where the horizontal track curves away from the vertical track (about 3/4 of the way open). 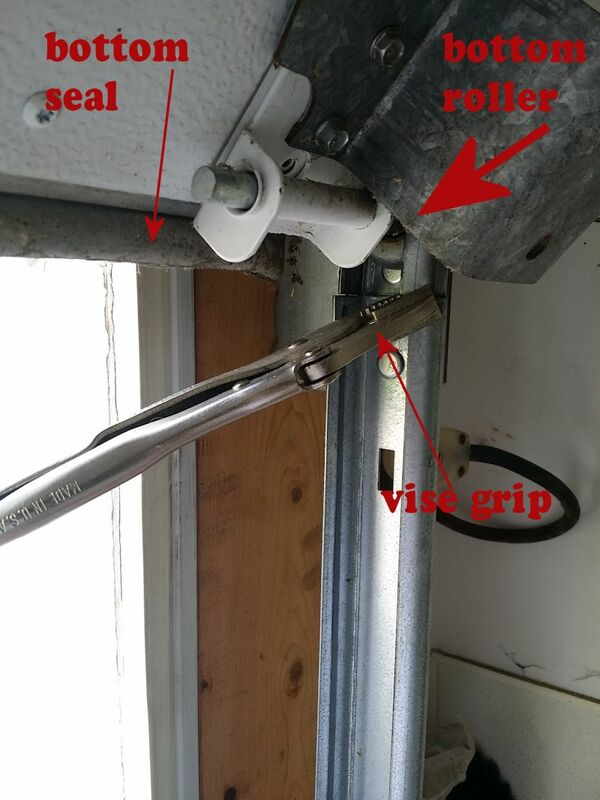 Put vise grips on the vertical track just below the bottom roller to keep the door from drifting closed while you work on it. Remove Old Seal - pull the old seal out of the aluminum retainer. The ends of the seal may be tucked back into the retainer & need untucked first or sometimes screws are put in near the ends of the seals to hold it in place so look for those & remove them if your having trouble pulling the seal out. You may also need to use a utility knife & cut down the length of the seal and pull the seal out in pieces. Clean the Aluminum Retainer - use a wet cloth & wipe down the entire length of the retainer (this is the part of the door the seal slides into). You can also take a screwdriver and run it the entire length of each channel & make sure it's smooth. If you find any parts that are dented or bent use needle nose pliers to straighten the channels. Lubricate the Retainer - use a bucket with some soapy water and a rag or sponge and coat the entire retainer so it's dripping wet. This will help let the seal slide through the retainer channels. You could also use a lubricant but be careful as it could have an adverse reaction with the rubber or vinyl seal you're installing (soapy water works best). Find A Helper - if you want to take some of the frustration out of installing bottom seal then find someone to help you at this point. It is much easier with two people. Install the Seal - if you found a helper then you will put both of the "T" parts of the seal into the retainer channels and start pulling it while your helper will "feed" the seal into the retainer while keeping the seal they're feeding level with the bottom of the door as they "feed" it to you. This will keep the seal you're pulling from flopping over & catching. If you're trying to do this by yourself then you'll need to keep going back & forth from trying to "feed" the seal in and then going over & pulling it through. Fold the Seal - once you have the seal pulled the length of the door you should have about 3" sticking out beyond the width of the door. Now fold that 3 extra inches of seal back onto itself so it goes inside the retainer. Do this on both ends of door. Some people put screws into the seal to hold it but there's no need to put extra holes into your door. Folding the seal back onto itself will hold the seal in place. Lower the Door - remove the vise grips from the track and lower the garage door. Engage the door to the garage door opener (check your garage door opener manual - most will re-engage automatically). Plug your garage door opener back into the outlet. Run the Garage Door Opener - sometimes a new seal will add a little height to the door (since it's not all flattened out like the old seal) so it's a good idea to run the opener & see if it closes properly. If the door goes down and then reverses once it hits the floor you'll need to adjust the close travel limits on the operator so it doesn't go down as far. Follow the instructions in the operator owners manual for instructions on travel limit adjustments. 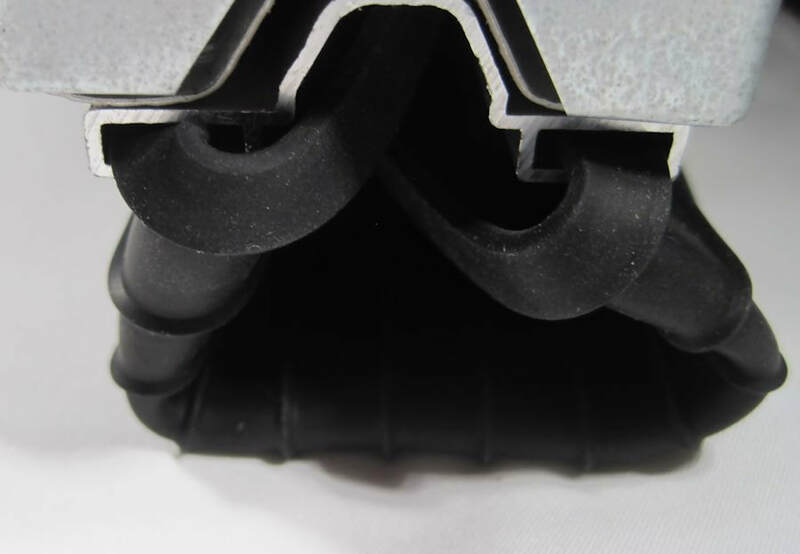 YOU DID IT - you now have new bottom garage door seal that should last for years and help keep your garage warm and dry. Send an email to us at: Tips@GarageDoorZone.com and we'll try to help you out.